For the first time ever, Apple is the dollar share leader in the U.S. home PC market, with the Mac taking 29.4 percent of every dollar earned from domestic home computer sales. Analyst Charlie Wolf with Needham & Company crunched the numbers from Apple's September quarter, and found that Apple's near 30 percent share of dollars spent was ahead of HP, at 20.6 percent, and Dell, at 12.9 percent. Apple achieved the milestone with just 12.2 percent of all unit sales, though that market share was also a record number. But Wolf's numbers are based on the higher average Mac selling price reported by market research firm IDC. Apple's own average selling price reported for the September quarter was about flat with the previous June quarter. "However, in an e-mail response, IDC stood by its average selling price estimate," Wolf wrote. 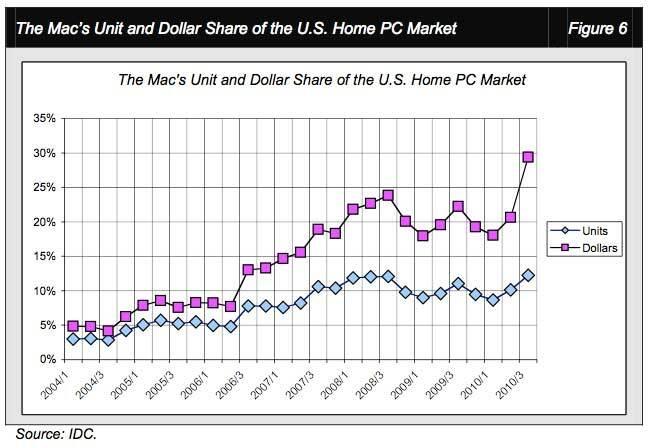 "If Apple's average selling price were substituted for IDC's, the Mac's dollar share of the U.S. home market would fall to 20.0%, slightly less than HP's share." While Apple's market share has inched higher, its dollar share has grown much faster in the home market. This reflects the fact that Apple has shown pricing discipline with the Mac platform, while rival PC makers have aggressively lowered their prices. Worldwide Mac sales significantly outpaced the home PC market in the September quarter, as Apple's shipments grew 25.3 percent year over year, compared to the market-wide rate of 10.4 percent. Apple has also had strong Mac sales in the business market, growing 66.3 percent last quarter, compared to the market rate of 8.5 percent. "To put these percentages in perspective, the home market still represented a commanding 63.2% share of total Mac shipments in September while shipments in the business market accounted for just 18.6%," Wolf wrote. "Nonetheless, the second consecutive quarter of stunning growth in the business market could possibly represent the canary in the coalmine." IDC's figures also show that Apple grew an impressive 503.9 percent year over year in government computer sales, versus the market average of 8.3 percent. 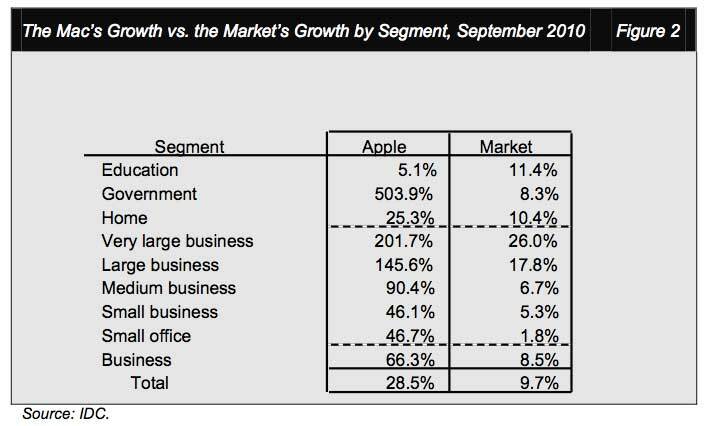 And Apple grew 201.7 percent with very large businesses, while the market grew 26 percent.